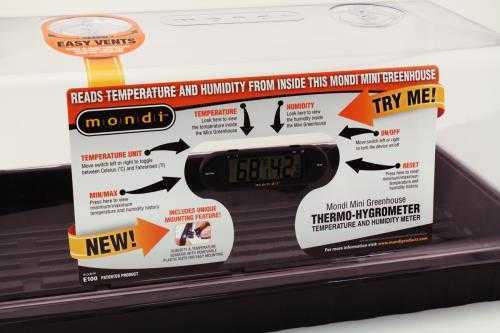 This revolutionary product mounts anywhere on your Mondi Mini Greenhouse and reads the temperature and humidity inside the dome. In combination with Mondi Easy Vents, it ensures plants get the start they need by providing growers with the essential real-time information necessary to produce large quantities of healthy plants. 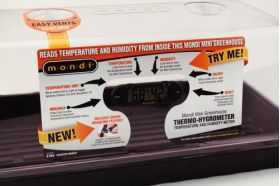 Displays current temperature and humidity, as well as min/max temperatures and humidity history. Celsius and Fahrenheit. Made from premium Japanese components and technology. Includes battery.